In this segment of Cooking 101 I will try to answer questions related to How to Cook Rice, this includes a discussion of what type of rice to buy, how to store rice, preparation methods, and great recipes that call for rice. Long Grain Rice - This type of rice stays separate and fluffy after being cooked and is great in side dish recipes, pilafs, and salads. Short Grain Rice - This rice will clump together when cooked and is usually used in sushi, desserts, or pudding, or where you want the rice to stick or clump together. Brown Rice - This is the least processed type of rice. It contains more bran than white rice and also takes longer to cook; usually 45-60 minutes on the stove. Parboiled Rice - This rice as been steamed and dried and takes about 20 minutes to cook on the stove. White Rice - The bran layer has been removed from this rice, it is sometimes enriched with vitamins and minerals, and can be cooked in 15-20 minutes. 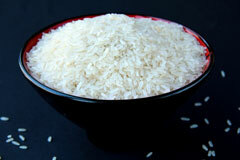 Specialty Rice - This includes basmati, jasmine, and arboria rice amongst others. These types are often aromatic or are used in specialty dishes. For example arboria rice is featured in risotto. Brown Rice has a little more oil content and has a shorter shelf life, often 6 months. It will stay fresher longer if you store it in the refrigerator. Rice, except for enriched rice, can be rinsed before cooking if desired. In general, follow the package directions for cooking rice. I frequently cook long-grain brown rice to serve as a side dish. The rule of thumb is to bring twice as much water to a boil as the uncooked rice that you are planning on cooking. So, if you are cooking 2 cups of uncooked rice, first bring 4 cups of water, or broth, to a boil. Then add the rice, stir once, lower the heat to low, and place a fitted lid on the pan. My experience is that rice has a better consistency if it cooks without having the cover lifted off. This can be a little tricky if you don't have a glass covered pan. I usually shake the pan a bit back and forth, while still keeping it flat on the burner. This helps to "stir" it a bit and allows me to hear if there is still liquid sloshing about in the pan. Preferably, I like to use a glass covered pan so I can see the amount of liquid left in the pan. If you see a lot of "bubbling" around the lid, you can use the shaking method to disperse of the bubbles without lifting off the lid. In addition to the stove top, I highly recommend using a rice cooker especially if you like to serve rice but don't have time to tend to it on the stove. It is especially convenient when serving rice at a party or for dinners when you family may be eating at different time as many rice cookers have a "warm" function. When cooking brown rice in a rice cooker, I usually plan on about 2.5 hours to cook the rice. I often use chicken broth instead of water and add a chopped onion and other spices for flavor as well.